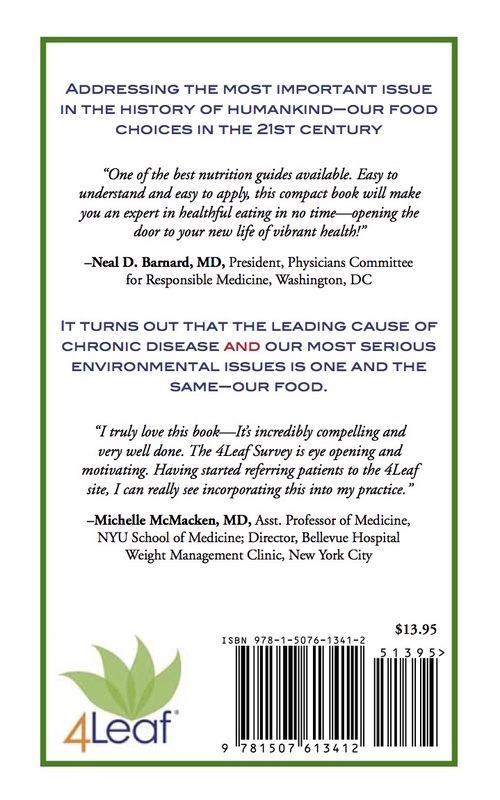 Dr. Kerry Graff contacted me in April of 2014 after finding our 4Leaf materials online. She had seen Forks Over Knives a few months earlier, then concluded that she had been short-changing her patients during her twenty years of practicing medicine. After deciding to convert her family medical practice from “sick care” to true “health care,” she began searching online for tools that would help her share her new found knowledge with her patients. That’s when she found me, J. Morris Hicks, and the 4Leaf Program website that featured the kind of handy tools she was seeking. Since that time, she and I have developed new tools together, rebuilt the 4Leaf website and are about to publish our first book. Pictured here are working images of the front and back cover, along with the book’s Introduction. 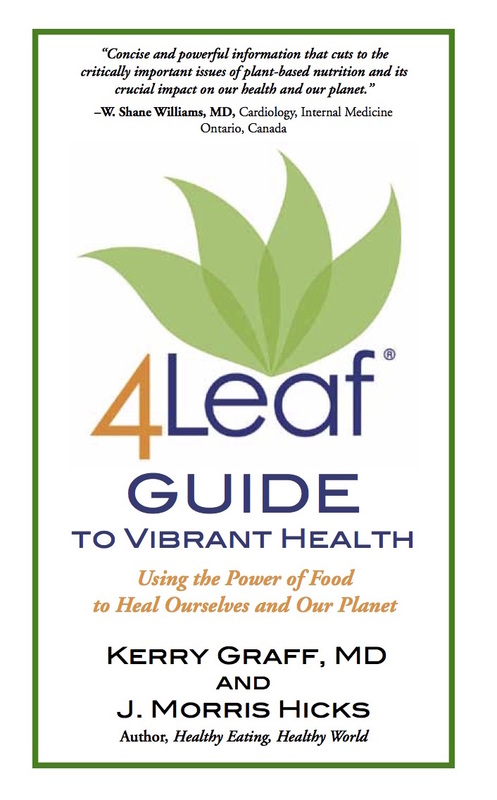 This 4Leaf Guide contains everything you need to get started down the road to vibrant health. It also addresses the most important issue in the history of humankind—our food choices in the 21st century. In the pages ahead, you’ll learn all about why that issue is so important and why you should be eating a more optimal diet, for reasons that go far beyond your own health. In the first chapter, Dr. Graff tells the gripping story of her own enlightenment when it comes to the critical task of simply choosing what to eat. She then explains how she leveraged that newly gained knowledge to begin the joyful process of “making good” on the incredible failures of her profession. You’ll learn all about the simple 4Leaf approach to healthy eating and how to explain it to others. You’ll learn how to get started when it comes to things like figuring out what you’re going to eat, getting all of the unhealthy stuff out of your kitchen and tips to remember while shopping. We’ll also provide you with some starter recipes and will steer you to some great online resources for many more. Most of the chapters are less than five pages with descriptive titles so that you’ll have no trouble finding what you need. In addition to valuable tips for integrating this healthy way of eating into your busy lifestyle, you’ll also learn how to deal with the plethora of questions, criticisms and unsolicited advice you’ll be receiving from your friends, family and colleagues- as many of them may think that you have lost your mind. Throughout the book, you’ll enjoy reading a number of success stories as told by Dr. Kerry Graff. Finally, you will appreciate the Epilog by J. Morris Hicks, as he chronicles how we got into such a mess in the first place, when it comes to the staggering global consequences of our poor dietary choices. To learn more about Dr. Kerry Graff, J. Morris Hicks, and the rest of the 4Leaf Global team, click here.